The recent tragedy of the huge earthquake in Nepal is a graphic representation of the state of the world today. Even the strongest of institutions seem to be falling. Is there any hope? 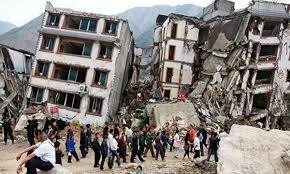 By now everyone has heard about the thousands who have died or been injured due to the earthquake in Nepal. But perhaps what is more disturbing is the frequency with which such tragedies occur these days. Whether natural or not, the encroaching tide of tragedies of all types is weighing heavily on people around the world. One such event may be brushed aside; two may be endured; but when tragedies come one after the other, people become overwhelmed and lose hope. A libertarian nation requires citizens who live according to principles, not impulses or whims. It requires individual maturity, self-sufficiency, cooperation, and all the other principles of peaceful coexistence. Yet it must not mistake tolerance for approval, or freedom for license. There will always be a need for boundaries and laws, but the degree to which these things are needed depends upon the quality of individual citizens. This requires principles of peaceful coexistence to be taught to succeeding generations, not by dictate but by example. Society must explain the rationale for its form of government, including reminders of other forms that inevitably fail. Respect for other people and their property is the key to the prosperity and peace of any nation. Clearly, the solution has eluded mankind because there are always control freaks who care nothing for anyone else. And these people are devious, which is how they keep fooling the many. For example, the film Captain America: The Winter Soldier did an excellent job of illustrating the “hydra” that infiltrates governments of the world. The selling point of the lie was that brutal control is justified if it promises to prevent war and crime. So it is hypocritical at its core; it would use evil and tyranny in the alleged pursuit of eliminating evil and tyranny. People have continued to fall for this lie throughout human history, under the mantra of “the greater good”. So where is the hope? Not in this world, and certainly not in any human institution. If history teaches us anything about this, it is that we cannot govern ourselves for long, or live in peace and prosperity for long. The reason is the low character of some, and the apathy of many. Building character takes time and effort, and an iron will dedicated to sound principles. Conversely, living at the whims of our impulses and desires is quite easy, as is having no concern for what’s going on in the world until we are forced to face it. Evil and corruption grow and prosper because the majority can’t be bothered to face it and deal with it when it is small and weak. In fact, the complacent often mock those who see evil in its infancy and warn of its danger when fully grown. Paul Campos, “Opinions: PAUL CAMPOS: Abortion and the rule of law,” Scripps Howard News Service, 2002-JAN, at this link. The prevailing societal acceptance of slavery was inherently wrong, and the Christians who acted on their convictions did what was necessary to turn the tide of public opinion. So we see in this example that a minority view was eventually imposed on the majority, and that this has seen lasting change in the United States (though not in all parts of the world, as slavery is still openly practiced in primarily Islamic societies as mandated by their religion). And it came about, not by passive unwillingness to confront, but by actively confronting, annoying, and provoking society into shame. Academic debate was not enough; passive silence was not enough. Failure to confront is one of the greatest sins of the modern Christian community, and partly to blame for the continued murder of the unborn. We should have been marching in the streets since Roe v. Wade was enacted, as much as others would be if slavery were practiced openly in this country once again. We have been too intimidated to push our morality on society, even to save the unborn, because we have greater fear of anti-Christian rhetoric than we do of God. Many of us would dearly love to have no need of human government, but naivety will not result in peace. Our own timidity and apathy on matters that should have us carrying torches and pitchforks is why evil prospers. We have swallowed the lie that we must not try to “ram our religion down their throats”, even while they do that very thing to us with their own “religion” of self-centered indulgence. As stated already, the question has never been whether it’s right to impose our will on others. We have failed to be the “salt” and “light” of the world, out of fear of being seen as unloving or tyrannical. Recalling the Orwell quote, the Christian community must stop attacking the few who stand up and make waves. Jesus likened us to sheep and shepherds, but a good shepherd knows that the passivity and gentleness required for the sheep has to take a back seat to the violent confrontation required for wolves. Let the shepherds fight them off (see also this article). It isn’t ideal; it isn’t pleasant; it isn’t peaceful. But in this world of wolves, it is necessary, and it’s the reason the Holy Spirit gives some people the gift of shepherding. And of course, this doesn’t mean the traditional “pastor” and church CEO, but whoever goes about exposing and confronting error. Our hope is found only in Jesus and his soon return. But while we must of course be all the more diligent in spreading the Gospel, we must also be diligent in training and nurturing all who come to faith— not with the typical Sunday School “group therapy” but with study, analysis, and spiritual power. We are in a spiritual war whether we like it or not, and those who are medics or cooks must stop criticizing the soldiers. We will never change the world as long as we keep attacking each other for exercising their spiritual gifts. We’re all different for a reason.